APPLE, specifically iPhone, leaks are not uncommon in our world of gadgets and technology. Typically the rumors and news surround new iPhone models or Mac computers, we even saw a little excitement around the release of the lightning connector. However, APPLE may just have solved a problem that has plagued the computer community since the USB was first released. The reversible USB connector will allow the user to plug the USB into the PC or Mac without the hassle of the 5/50 trap that many of us have fallen into as we fail to insert it correctly on the first try, or will it. Unfortunately, many of us have failed to insert the USB connector into the female slot, only to turn it around and meet a fate in which it does not fit, then flip it back around and it slides right in. 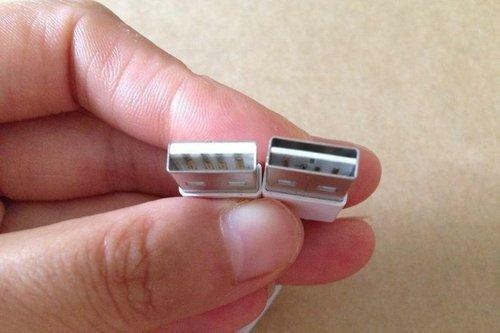 The witchcraft that has cursed us all may just have been reversed by APPLE’s new US connector. A statement in a patent that was filed by APPLE in 2013 explains the technology behind the device. However, despite APPLE’s patent filing, it seems hat UltraTek was the first to patent the device, as evident by their 2009 patent application. Currently, UltraTek is selling their device online as the Flipper. Apple undoubtedly knew about their patent at the time if the new reversible USB development, and most likely updated the design implemented propriety features into the device so it works with their devices only. There is also the possibility that APPLE bought the patent in secret, since they have a thing for not allowing their secrets out, we may never know for certain.